Choi Jeong Hwa’s large sculpture stands in Rinko Park in Minato Mirai, Yokohama. Ten imitation wooden logs encircle a sculpture at the edge of Rinko Park, Yokohama. An earthy, brown rope is threaded through them, politely separating a quiet public garden from a bumper crop of jumbo plastic fruit and vegetables. Stuffed between large leaves, its harvest is so densely packed that any branches are obscured and its structure is concealed. 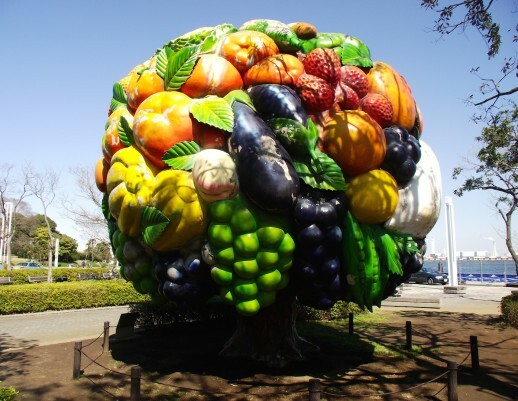 Commissioned as part of Yokohama’s first Triennale of contemporary art in 2001, the five metre-tall Fruits Tree (2001) by the Korean artist Choi Jeong Hwa is one of several public art projects envisaged to continue after the festival. Built on a steel frame, Fruit Tree is moulded from fiberglass and reinforced plastic. After fabrication, it was painted and coated with a protective urethane coating. In using less traditional materials, its durability has since been harshly tested by the sea air. Sadly, its surface has peeled in places but it’s still a generous, bouquet-like sculpture to spot, even if it is slightly weather beaten. Seen in the round, it is a jumble of familiar fruits and vegetables. 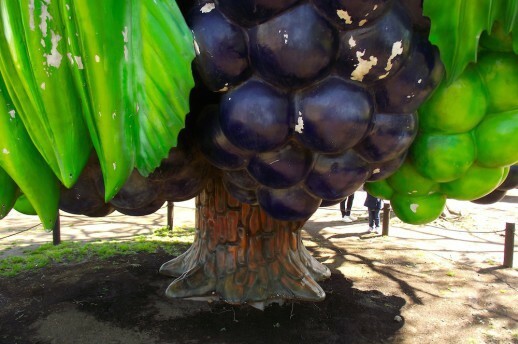 At the lower hemisphere of the sculpture, Choi has populated it with hanging grapes, corncobs and pea pods, keeping the work’s bulbous shape.Beneath the overhang of pretend foliage is the tree trunk. The bark is blocky, to appear coarse and textured, but is smooth and synthetic to the touch. It’s the inauthentic, theme park idea of tree bark, with the same earthy brown as the imitation logs and rope that surround it. Sitting on a raised concrete base, the entire piece looks as though it is levitating just slightly above the ground. Fruits Tree sits conspicuously and awkwardly with its surroundings. Parks are often regarded as welcome reprieves in cities because of their natural appearance. While it is known that they are constructed environments that feature natural elements, it is easy to interpret them as unconstructed because they haven’t been developed so markedly into residential or commercial centres. Seeing Choi’s work here is a reminder that parks and public spaces are cultivated and affected arenas, making Fruit Tree—in its completely unconvincing appearance—a suitable addition to these surroundings. It’s not an attempt at realism; it’s a showy, kitschy exaggeration of nature’s bounty. Since Fruits Tree, Choi has produced Flower Tree of a similar scale and brilliance. He’s also made an elaborate floral chandelier for Auckland Art Gallery in 2011. One of his best-known series of works are large floating lotus blossoms whose petals gently inflate and deflate. Whether he’s referencing cosmological symbols or reusing consumer goods, Choi seems enthralled in combining their appearance with synthetic materials. The result is one that aims to broaden the limits of aesthetic taste. The artwork’s charm is its inauthenticity. I fully expected to embrace something gaudy and tacky, but found its aged quality to give it something else entirely. Its rough surface made it difficult to pinpoint just what it belonged to and opened it to associations instead. If it is the stuff of theme parks, what world does it portray? All the better for not being perfect, for being a bit raggedy and for being impermanent, Fruits Tree is rather beautiful. It’s not a bad spot for a picnic either.